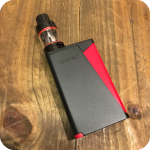 The H-PRIV Pro Kit from e-cigarette brand Smok is the ultimate purchase for serious e-cig users looking to smoke continuously throughout the day with this innovative, stylish, and powerful new vaporizer. The kit comes with the powerful H-Priv 220 (output power) mod made of zinc alloy and providing users with the ability to adjust temperature anywhere from 200 to 600 F°. 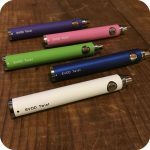 This kind of power enables smokers to enjoy their favorite e-liquids on-the-go all day without needing to recharge. 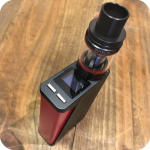 Heat adjustment is an innovative feature that allows temperature to be altered to fit your personal vaping preferences, for more flavor (low heat) or bigger clouds (high heat).The top of the vaporizer has an OLED screen displaying the temperature, +/- buttons for adjustment, and the 510 thread count port where the TFV8 Big Baby tank comfortably rests. Smok has also created new innovative technology that makes their battery easier and safer than ever. Thanks to magnetic holding features, battery replacement is quick and painless. Clear instructions and a layer of insulation protection have been implemented for increased user safety, and venting holes at the bottom help dissipate heat. The kit isn’t complete without the TFV8 Big Baby tank, which has a 510 thread count, is made out of stainless steel, and can hold up to 5ml of e-liquid. This big boy comes with a pre-installed quadrupole coils and a pair of sextuple coils as a back-up, as well as a replacement glass tube for your precious tank. The kit is completed with a USB charging cable, a user manual, and various spare parts should your product fall into disarray upon extended use. Taking a look at the H-PRIV Pro, your first question might be: where’s the button? Smok has ingeniously and stylishly built their operating button inconspicuously into the side of the vaporizer. When the red triangle on the side of the product is pressed, the H-PRIV will begin quickly heating the e-liquid inside the tank. This design is both discreet and stylish, coming in three different stunning colors to compliment the button’s red accent — gold, blue, and black. Be sure to note your color preference in the comments/notes section of your order! Tags: big baby tank, e-cig, e-cigarette, e-liquid, h priv, h-priv pro, h-priv pro kit, hpriv, hpriv pro kit, kit, smok, vape, vaporizer.